Over 2,100 scholarship recipients were refused formal entry to CONICET, which many claim will force young talent to leave Argentina all together. Argentina’s researchers say austerity measures affecting science and technology are forcing many of the country’s brightest to consider immigrating. 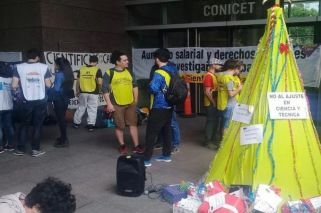 Researchers at the centralised CONICET research body, which receives funding from the Science Ministry, protested Wednesday against the Mauricio Macri government’s cuts to research funding. Over 2,100 scholarship recipients were refused formal entry to CONICET, as is the normal practice for researchers in the early stages of their careers, which many claim will force young talent to leave Argentina all together. “This is a national day of protest after we learned this week that 2,145 researchers were left out of the system. They were fired”, Pedro Cataldi, a physicists at CONICET, told AFP. Scholarship recipients learned their fate the previous Friday when the selection list for permanent researchers was released. Those lucky enough to be selected, just 450 of the current 2,600 scholarship recipients, will now join as permanent staff members at CONICET. The funding cuts are “part of a brutal austerity measure that does not only affect the income of the permanent staff at COINCET but also the funding of individual institutes and investigation projects”, Cataldi, who is part of the activist group Insecure Scientific Youth, told AFP. The group protested outside the entity’s headquarters in Buenos Aires to demand their colleagues be granted secure employment. In 2017, CONICET had a full time staff of 14,400 people, of whom 10,255 were investigators and 2,700 support and administrative staff. Those numbers are around 10 times higher than in 2007, according to data published on its official website. The protest extended across the country to cities like Córdoba, 700 kilometres from Buenos Aires, which is home to a sizable population of university students. “Science is in mourning”, was the catchphrase used to characterise protests there. Several participants, among them researchers, dressed in black and carried out a pretend “funeral” using a coffin and reciting prayers for science – and others against the Mauricio Macri government, which is blamed for the cuts affecting the sector. “The austerity measures have many worrying components like the deterioration of salaries due to inflation. There are subsidies which are not executed, institutes which are totally failing as a result of a lack of budget, making the development of science and technology in our country much harder,” said Victoria García, researcher and gender spokeswoman at CONICET. “There are many people who have held scholarships for seven years in order to become CONICET researchers and now they are not able to properly begin their careers. The State invested several years in their training and, just like in the 1990s, they end up going to Europe or the United States for research”, Matías Botana, one of the protesters present at the Córdoba event, told AFP. Argentina is experiencing an economic crisis characterised by the depreciation of its national currency and inflation, which reached 51 percent in 2018, when it agreed to a US$ 56 billion loan deal with the International Monetary Fund (IMF). 7Can the art of the message save Macri?